Get Your Rear in Gear was back in Charlotte for the third year on March 10, 2012. Over 1,900 people participated in the event. “We are amazed that we continue to grow this event each year and love seeing so many members of our community come together to learn about colorectal cancer,” said Mary-Karen Bierman, Get Your Rear in Gear Charlotte co-director. 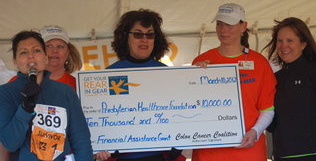 This year, Get Your Rear in Gear presented the Presbyterian Hospital Foundation with a $10,000 grant to create a Financial Assistance Program for colorectal cancer patients in the Queen City. This program is designed specifically for colorectal patients currently under treatment. Eligible patients receive a $250 grant which is designed to help them pay everyday expenses while in treatment. “No one should have to decide between paying their electric bill or paying for chemotherapy,” said Susan Falco, Charlotte co-director. The fund is being administered by the Buddy Kemp Cancer Support Center, which takes patient referrals from nurses and social workers who have daily contact with these patients and have a unique understanding of their financial needs. Since the inaugural Get Your Rear in Gear Charlotte 5K event in 2010, over $115,000.00 has been raised for colorectal cancer awareness and support programs in the Charlotte, N.C.-area. Get Your Rear In Gear Charlotte has also partnered with the Buddy Kemp Cancer Support Center to provide a grant to start Charlotte’s first-ever Colorectal Cancer Survivor Support Group. This group is dedicated to providing all colorectal cancer survivors with much needed educational and emotional support. The group meets on the first Monday of each month from 6pm-7:30pm at the Buddy Kemp Cancer Support Center. Funds raised at the events have also been used to provide financial assistance for colonoscopies for the uninsured. You can read more about how the Charlotte event has impacted colon cancer patients and their families in this story from the South Charlotte News.